OK, I’m just going to say it. I. Love. Salad. I really do. This is a pretty remarkable thing for a girl who used to weigh just 5-pound less than Tom Brady (who, according to the New England Patriots website, weighs in at 225). It’s worth mentioning… I am not 6’4″ tall. A good salad can be a filling, satisfying and delicious meal…especially in the coming warmer months. They are also great canvases for creative inspiration in the kitchen. Stroll through a farmer’s market–just about any veggie you see would probably be yummy in a salad. Another place I find salad inspiration: restaurant menus. As more and more restaurants are striving to accommodate healthier eating preferences, food allergies and just provide more healthy fare in general, the salad section of the menu can be incredibly diverse and intriguing (just be sure to order the dressing on the side :)). 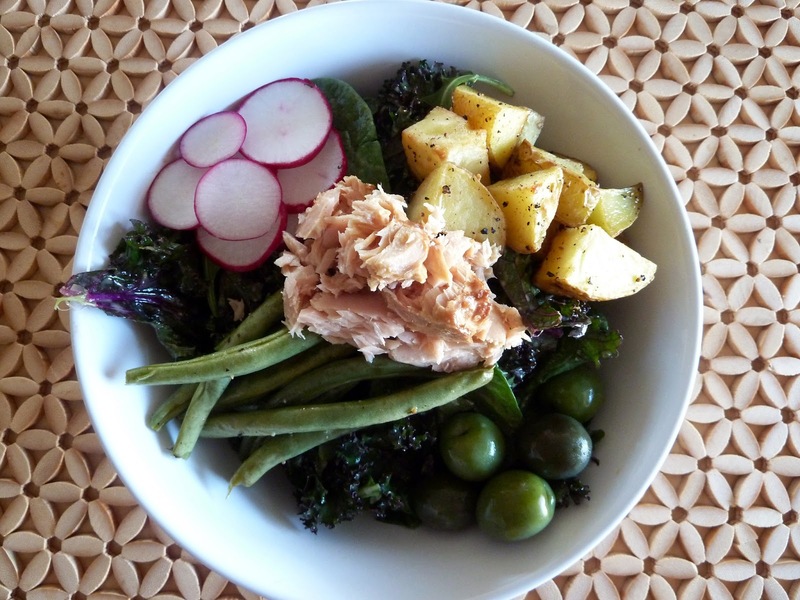 One of my all-time favorite salad is the ‘Salad Nicoise’. I seriously love this salad. I actually get excited when I see it on a menu (which is pretty rare). I love it that much. Named for the small, black, shriveled olives that garnish the salad, you are likely to see many interpretations. The most traditional includes aforementioned nicoise olives, high-quality tuna, small potatoes, crisp green beans and hard boiled egg. I have taken some liberty with this recipe: I roasted the potatoes and green beans (they are typically steamed or boiled), used a different olive since I couldn’t find nicoise, omitted the egg and added radish. Once you’ve made it a couple of times, take some liberty. Try swapping the tuna out for sardines or substitute asparagus for the green beans. One more note, though Tonno tuna can be spendy (expect to pay around $7 for 4-6 ounces), it’s totally worth it in this dish. Remember, it’s a main course, so don’t skimp if you don’t have to. If you’re feeling particularly indulgent, get tuna packed in olive oil. So Good.